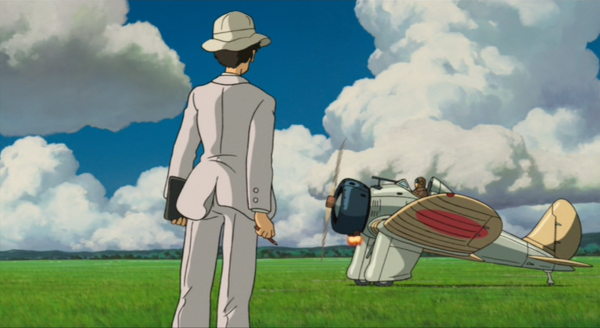 The Wind Rises (風立ちぬ /Kaze Ta chi nu, with the nu being a somewhat archaic verb ending implying that things are happening, so perhaps The Wind is Rising), is the last anime movie directed by Miyazaki Hayao before his [current] retirement. It’s interesting because of the subject, the sources, what’s in it, and what isn’t in it. 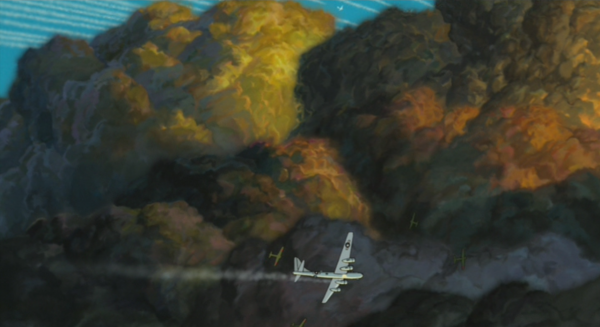 At the highest level, it’s Miyazaki’s dream of airplanes. He loves airplanes, particularly seaplanes, particularly Italian planes (his studio is named after the Caproni Ca.309 Ghibli). 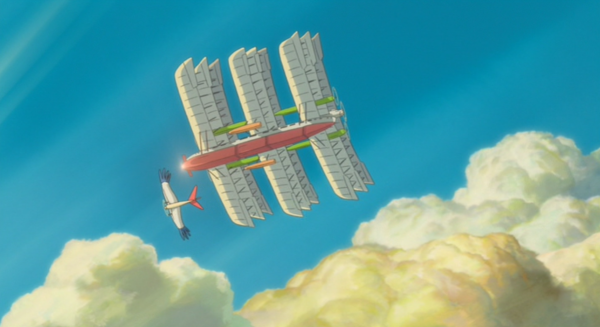 What I consider his best film, Porco Rosso, was about seaplanes flying in the Adriatic between the World Wars. 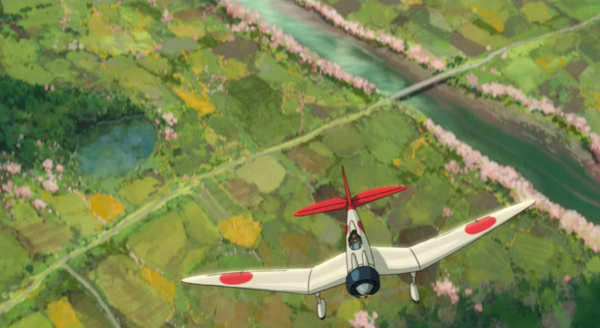 Next level down is his dream of the life of Horikoshi Jirō, designer of the Mitsubishi A6M Zero fighter. I say dream here, because Horikoshi’s life wasn’t anything like the movie, as we’ll see. And finally, it’s about Horikoshi’s deams of designing and building airplanes. And within those dreams? Horikoshi dreams of meetings with Italian seaplane designer, Giovanni Battista Caproni. Even the aircraft in the anime are dreamlike, with engines that sound more like a skilled ventriloquist mimicking their noise. The movie has a long introduction and a short epilogue, with the twin-themed main story bookended by identically portrayed disasters. In the introduction, young Horikoshi has a dream in which he meets Caproni and decides to become an aeronautical engineer. The first disaster hits as he’s on the train back to Tokyo University, where he’s working to make his dream come true. 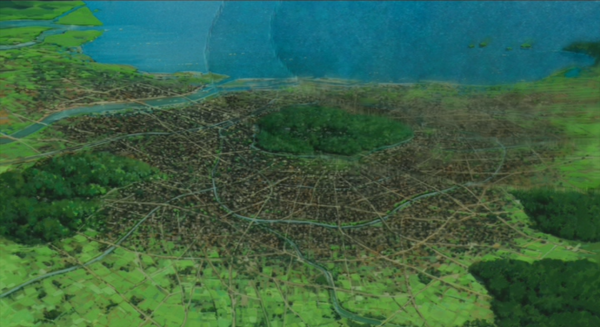 It’s the September 1, 1923 Great Kanto Earthquake, which pretty well leveled Tokyo, and then set fire to the ruins. 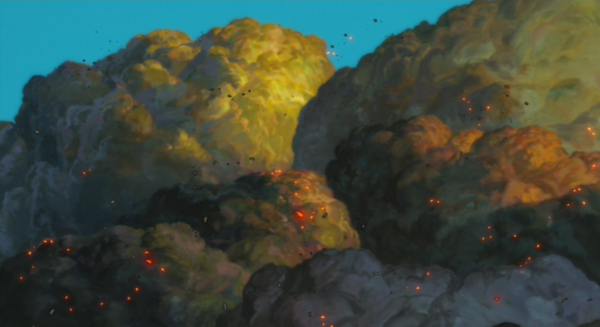 The earth shakes, the houses collapse, and soon there is a pall of fire and smoke above the entire city. The portrayal of the earthquake is the best I’ve seen in any movie. On the train, he meets his future love Nahoko Satomi, and helps rescue her maid after the earthquake. Ten years later they meet again, fall in love, and are betrothed. Unfortunately, Nahoko has tuberculosis, and wants to wait until she has gone to a sanatorium and is cured. 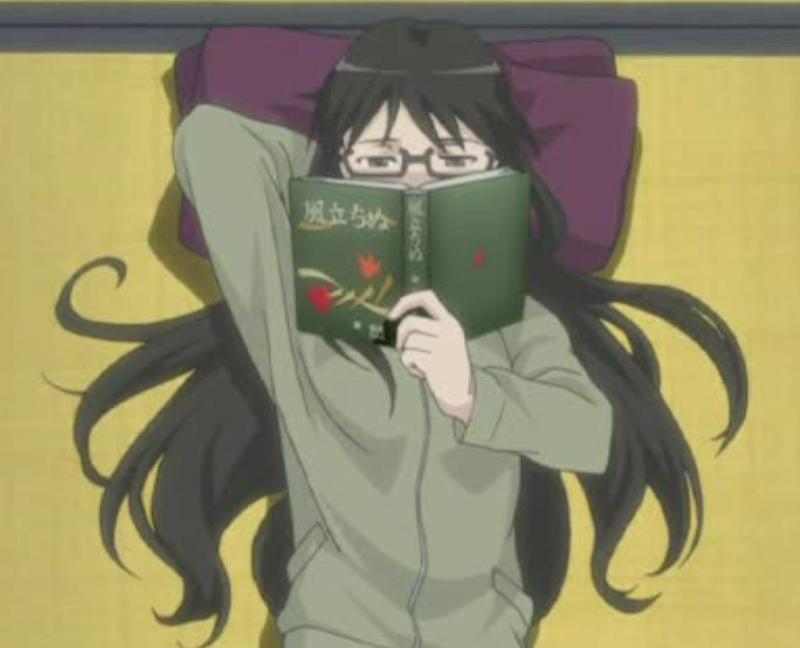 This being anime, that, of course, never happens, and they end up marrying once they realize that she’s going to die. 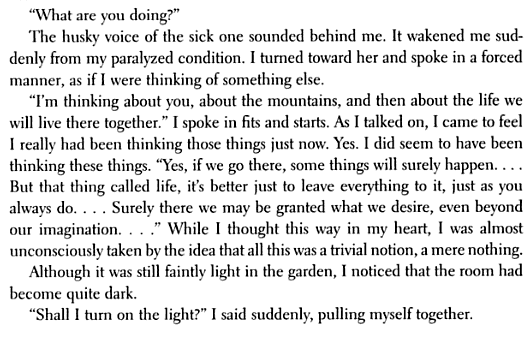 After a brief but happy interlude, she slips away to the sanatorium to die, so that he will remember her as healthy. This is the dream part of the biography. Horikoshi’s wife didn’t have tuberculosis, and she and their two sons survived the war. The story, and the anime title, were adapted from a 1937 psychological/autobiographical novel by Hori Tatsuo, about a man visiting his fiancée in a sanatorium. I have read translated excerpts, and it is as dull and as interminable as you might imagine a novel on that topic from that period (There’s an example in a collection of Japanese literature available through Amazon books. The interior link is on page viii of the Contents, and the story itself is on page 376). There’s many more pages like this. The second theme is Horikoshi’s efforts to design beautiful aircraft. * Unfortunately for him, the only people buying aircraft between the wars (Japan is suffering from both the earthquake and the Great Depression) is the military. His experiences are about par for the course for aircraft designers of that era –they crashed more often than a Monty Python castle. The first plane he contributes to the design of crashes, and Mitsubishi doesn’t get the contract. He’s the lead designer on the second plane (Mitsubishi 1MF10), which does well in its initial flights but we later see the wreckage in a hangar (and the contract is cancelled). It’s this discouraging development that causes him to take a vacation in the mountains, where he renews his acquaintance with Nahoko. Finally, he has success, designing what will become the Mitsubishi A5M (Claude), but that success is bittersweet, because it is while he is at the first test flight of the new aircraft that Nahoko dies. The ten years from that first flight in 1935 to the end of WWII are skimmed over in about six chords of doleful music, and the main story ends with Tokyo again in flames, with the pall of fire and smoke above the entire city looking much like the aftermath of the earthquake. This time the disaster is due to B-29 raids. The epilogue has Horikoshi walking through the wreckage of airplanes up to another dream visit with Caproni, and a brief encounter with Nahoko, who tells him to live. 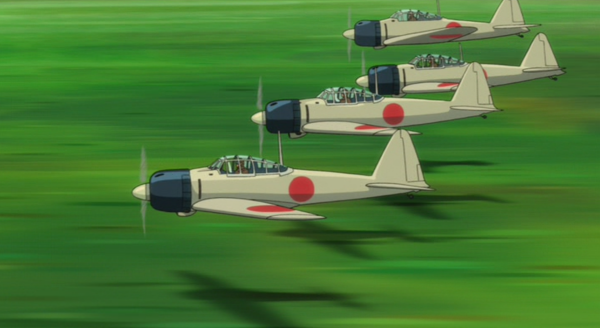 Horikoshi’s crowning achievement, the Mitsubishi A6M Zero fighter is relegated to a walk-on at the very end, when a flight of twelve zooms through his dream and up into the stream of pilots and planes in aeronautical heaven, a direct reference to a similar scene in Porco Rosso. In addition to its biographical aspects, the story is a snapshot of Japanese society between the wars. Horikoshi starts out as a young boy, sleeping under mosquito netting, wearing a yukata at home and a haori and hakama with getas at school, and ends up in Western dress, with coat and tie and fedora. Servants run around in their blue haoris with the house emblem on the back. Everybody smokes (although the real Horikoshi didn’t). 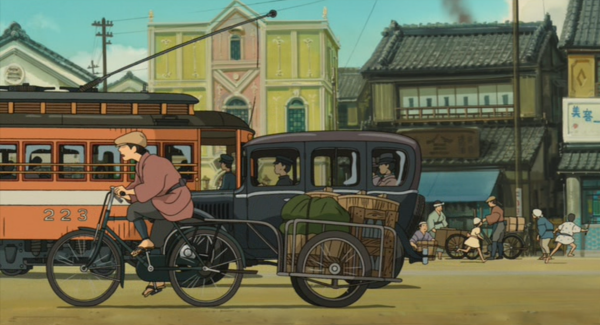 Almost every outdoor scene has people pulling and pushing carts and riding bicycles and hand-carrying loads. The complex contradictions within Japanese society between the wars is illustrated by the fact that the new aircraft are hauled to the test airfield using oxen. What’s missing from the anime, as many have pointed out, is any sign of remorse for the use to which his airplanes were put, or for Japan’s role in WWII. Horikoshi, or rather, Japan, is chided gently by the German he meets in the hotel — Japan has forgotten that it started a war in China, that it established Manchukuo, that it left the League of Nations and allied itself with Hitler. Horikoshi himself was responsible for hundreds of deaths by way of his aircraft. The anime acknowledges this through no more than a nod in that direction, and many people have a problem with this. 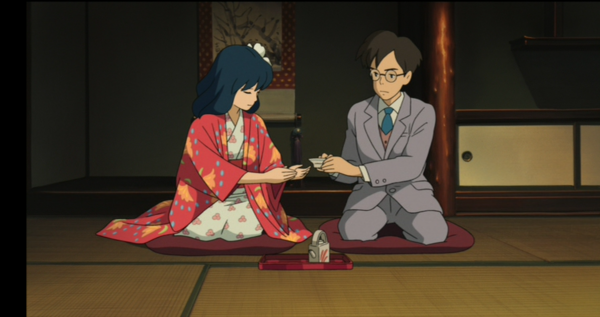 Miyazaki sidesteps the issues by ending the story in 1935. At that point in time it was still possible to admire the European dictators. People might not like them, but they seemed to be winning the battle of the Great Depression. Hitler had been legally and democratically elected two years before. Mussolini had been legally, if somewhat less democratically appointed Prime Minister twelve years before, and if he was a dictator, he at least made the trains run on time. ** Indeed, in 1932 it was possible for P.G. Wodehouse to modify the words of a Cole Porter song (to make it more understandable to posh audiences in the West End) by writing “You’re the top, you’re Mussolini…” Hitler was not yet revealed as a monster, and the world had not yet descended into the hell of WWII. So, many of today’s complaints are a projection backwards of today’s morality, using 20/20 hindsight. 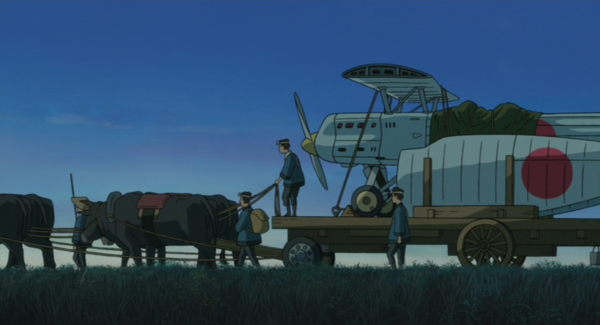 To me, Miyazaki just wanted to write an anime about airplanes, and an homage to a great aircraft designer, without having to shoulder all of Japan’s post-war guilt. In a way, Horikoshi comes across as a lot like Wernher von Braun, another engineer who was dedicated to his craft and who made a deal with the devil in order to practice it. * Note the impact America was already having on the world. The wing design for his first aircraft project uses a US National Advisory Committee on Aeronautics cross section. **Actually, he didn’t. Trains were notoriously bad in Fascist Italy. This entry was posted on March 18, 2015 at Wed, 18 Mar 2015 17:23:07 -0700 and is filed under Anime. You can follow any responses to this entry through the RSS 2.0 feed. You can leave a response, or trackback from your own site. This is great background material. Now I want to watch it again with all this in mind. The first time, I watched it with subtitles, so I could get the original [non-localized] dialogue from the characters. The second time, I watched it in English, so I could look over their shoulders at what else was going on. Be sure to re-watch Porco Rosso, as well. Porco Russo has been a goto movie at our house for years. One of our kids’ favorites (and mine).